Thomas Usher, with his brother Jame s, founded Usher Brewery, which was originally in Merchant Street. Later a new brewery, the Park Brewery, was built in St Leonards. In 1895 the firm became known as Thomas Usher & Sons, registered as a private limited liability company. It remained an Usher family business until 1959 when it was taken over by Vaux & Associated Breweries Ltd, Sunderland, England, and its name changed to Usher’s Brewery Ltd. It went into liquidation with the Park Brewery ceasing production in 1981. Thomas Usher was one of three brothers who have family monuments in the Grange Cemetery. He was born to Andrew Usher and Margaret Balmer on 27 October 1821. Brothers Andrew and John were younger than him. Thomas married Eliza Caroline Nelson (1830-1880) and they had 12 children. He died at his house in Lauder Road on 30 June 1896. 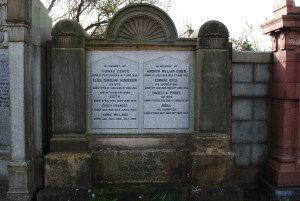 Along with Thomas and Margaret, three of their children who died young are buried in the grave: Edith (1858-1859), Emily Frances (1859-1863) and Annie Millard (1864-1880). To the right is the memorial to his eldest son, Andrew William Usher (1852-1902). Andrew took over the running of the brewery after his father died. He married Isabella Purdie (1852-1939), and two of their three children are buried with them: Edward Cecil (1880-1902) and Dora (1887-1972). Another of Thomas’s children is buried in the Grange Cemetery. She is Eliza Mary Usher (1856-1935) who married William Grant, and was living in Mansionhouse Road when she died.